A Dorset family say their 14-stone bull mastiff is so huge he can be seen from space. Using the Google Earth website, Boris’s owners spotted him sprawled out on the family lawn, reports the Daily Mirror. Arrrgh! Want to buy a scooter? Cheap? A 56-foot, 60-ton sperm whale died on a beach in Taiwan in January, 2004. Researchers wanted the carcass to perform an autopsy and for research, so they loaded the whale onto a tractor-trailer and set out through the city of Tainan, heading for the Shi-Tsau Natural Preserve. It took 13 hours, three cranes and 50 workers to get the whale loaded on the truck. Unfortunately, on the way through the city, gasses built up to a critical level in the whale and it exploded, spewing whale guts in the street, on the cars and over pedestrians. According to witnesses, the smell was pretty bad. Somehow that little hose doesn’t seem like it would help a whole lot. Now that’s a tree house! 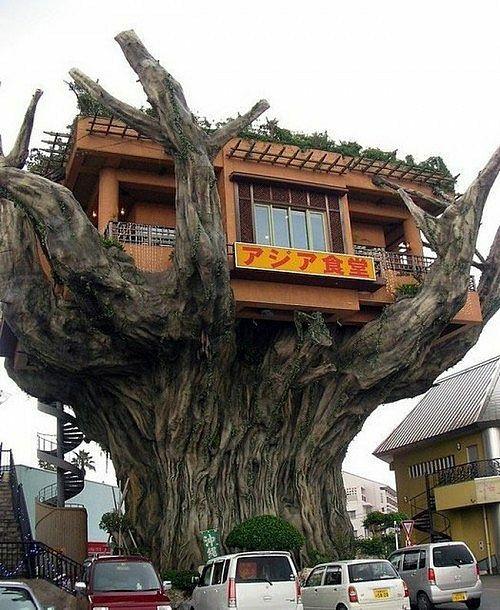 June 10, 2008 Posted by oldstersview | People, Strange	| house, tree, treehouse | Comments Off on Now that’s a tree house!